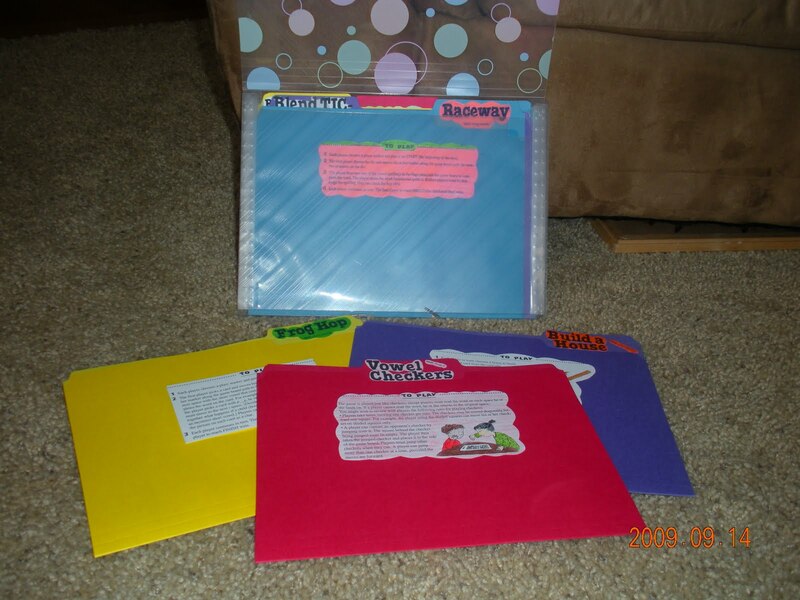 Every year, I have added a few more games to my File Folder Games box. Of course, with no toddlers eating my markers, drooling all over my papers and stealing my scissors to cut their own hair, it is much easier to cut, color and paste in peace. Self-checking file folder games are great for filling in those quiet moments when you are teaching one child and another is ever-so-patiently waiting for your attention. They are a fun way to emphasize a new skill you are introducing. Early on I could never afford the colored folders. When buying colored folder, make sure there isn’t printing on the inside. My early games were also very simple, but the kids enjoyed them, anyway. This summer, this was my book of choice. ISBN # 0-590-96380-5 Phonics Quick and Easy Learning Games by Wiley Blevins, published by Scholastic. It isn’t a file folder game book, but all the games were easily adapted for this format. The games reinforce beginning consonants, short vowels, consonant blends, long vowels, digraphs, rhyming words, r-controlled vowels and more. Unlike all my other file folder games, these games are for the parent to play with their kids. Since I only have one in elementary school, this will work for me this year. I made copies of each of the games and put the pages in their own file folders. I bought a plastic accordian folder at Target for $1. I also stocked a pencil case with with colored pencils, markers, scissors, and glue sticks and put both items in a tote bag. Every time I was going to be in the car longer than a half an hour, I carried the bag with me and worked on my projects. As I was working, I used post-it notes to mark what still needed to be done with each game. The book has a pattern for a die you are to make, but I knew that would last about one minute, so I opted for these paper spinners from a dollar store. I used little stickers to adapt each spinner for the options needed for each game. Office Max had free laminating for teachers last year, so I was in for about three weeks in a row with games and manipulatives I had been coloring for a few years in preparation for teaching first grade. This year, they offered 50% off, so I was thankful for that. If I don’t want to laminate, I use peel and stick laminating sheets from Avery. It is much clearer than clear contact paper, doesn’t bubble, but it more expensive and harder to find. When I tried to buy it this year at Wal-Mart, the kid sent me back to the fabric store where the rolls of clear vinyl were. When I tried to buy them at Fred Meyer, I ran into a pleasant clerk that hadn’t learned the English term, “laminating” yet, but was eager to help me. I knew there would be NO WAY I would be able to describe what I needed, so I hunted myself, but didn’t find them. These are my final sheets from last summer’s cutting and pasting. I glue the instructions on the outside of the folder and glue the game boards on the inside. While putting these away, I found a few I didn’t finish from last year. There’s ALWAYS something for a homeschooling mommy to do, isn’t there? Childcareland You also can sign up to receive daily emails with worksheets, craft ideas and video instructions for projects. My favorite site for pre-school and kindergarden. Preschool Printables I made some of these years ago. Very fun! Hope this inspires you to create fun learning activities for your homeschool. This entry was posted in file folder games, home schooling first grade, learning games, Phonics Quick and Easy Learning Games by Wiley Blevins on September 19, 2009 by Mindy.